By George Lincoln Rockwell. 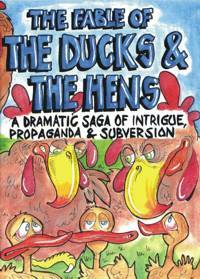 This ‘fable’ tells how the naive ducks had their happy lives wrecked by an influx of pushy, scheming hens. The story is superbly illustrated by over forty full-colour illustrations. A classic from the founder of the American Nazi Party which has been updated with superb new illustrations and presented in a highly readable format. Magazine size, 24pp.